Hundreds of genealogists from across the country and even the world will be descending on Raleigh, North Carolina, this week for the annual conference of the National Genealogical Society. This four-day, multi-track conference is one of the highpoints of the genealogy year, and gives The Legal Genealogist and so many others the chance to see what’s happening in the field, meet up with old friends and make new ones, and revel in the joy of being around like-minded people as obsessed with genealogy as we are. And for genetic genealogists, this conference offers so very much to learn and grow and develop. There are 20 separate sessions — both individual lectures and workshops — that focus on DNA in this 2017 NGS conference. There is, literally, something for everybody with even a passing interest in using DNA as part of the genealogical toolbox. And — because of an entire day of livestreamed lectures — there’s even something for those with an interest in using DNA as part of the genealogical toolbox who can’t make it to Raleigh. The livestreamed sessions begin at 8 a.m. with Pamela Boyer Sayre, CG, CGL, FUGA, and “When You’re Not Who You Thought You Were”: If Y-DNA testing identifies a totally different surname or ancestor than the expected one, what path leads to finding your own true biological identity?. 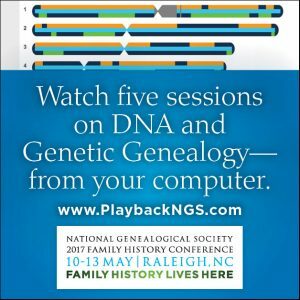 Next up at 9:30 a.m. is Angie Bush, MS, with “The Genetic Genealogy Revolution”: DNA is now a mainstream source for the genealogist. It has revolutionized how genealogical research problems are approached and is inspiring a new generation of researchers. At 11 a.m., Blaine Bettinger, PhD, will present “Using Third-Party Tools to Analyze Your Autosomal DNA”: Learn about third-party tools that allow test-takers to learn even more about their genomic heritage, including admixture calculators and the identification of genetic cousins. Then at 2:30 p.m., yours truly Judy G. Russell, CG, CGL, JD, presents “DNA and the Hidden Half of the Family”: Learn how the 21st century genealogist’s tool of DNA testing can shed light on women: the hidden members of our families. And closing out the day at 4 p.m. is Diahan Lyn Southard with “Five Tips to Make Sense of Your DNA Testing”: Overwhelmed with autosomal DNA? I can teach you 5 tips you can implement and understand today so you can find your ancestors tomorrow. It’s a great way to learn about DNA if you can attend the conference — and even if you can’t. How much is each day to do online? As stated in the post, the one-day fee is $95 for NGS members and $115 for non-members. If you combo it up with the second day of livestreaming (the BCG Skillbuilding lectures), the fee is $150.00 for NGS members and $185.00 for non-members. More info here.